In Date a Mink, you date a mink! 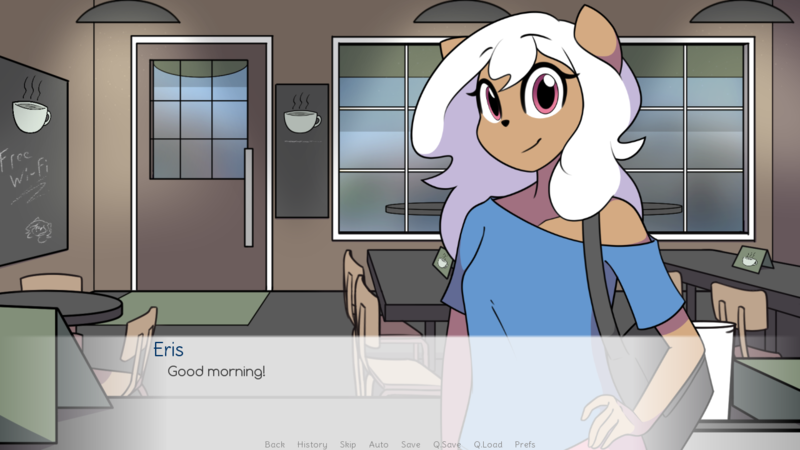 Date a Mink is a simple adult visual novel centered around a romance between the player character and Eris, the mink! Consider supporting my work on Patreon! *The soundtrack comes as both flac and mp3. 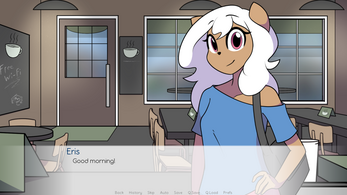 Version 1.1 - Added Gallery (CG Gallery, Music Room, and Scene Viewer). Contents are unlocked as you play through the story. Grammar fixes. 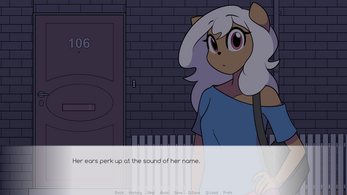 Version 1.2 - Minor art and grammar fixes. Gallery Added to Date a Mink! This game is great, true end kinda ruined it for me. Switch the best end and true end with each other and it would have been a perfect sweet game. Hope they meet again and end up together again if there was another game for it. I like the endings, I hate you for writing them. How many endings are there, if you don't mind me asking, so far I got True end, Best end, Ghost end, and Dump end. Is there any other endings? Those are all of the endings! Thanks for playing! What is the different between this and the Nutaku Version? They're both the same game, but the Nutaku version comes bundled with the art pack and soundtrack. You can also get the art pack and soundtrack here for the same price, but the main game is free. I would absolutely recommend this short game for those who desires to endorse in a short sweet story. Whether you'd like to play the game for the CG's, drawn in such a recognizable and unique style or play for the story, because yes, even in a game that max lasts an hour is able to drag you in to feeling almost bad for our female lead and grip you into her story. At least, it did for me. I enjoyed the game, yes the CG's were nice and to many people, it's exactly what they came for, but I in all honesty loved the little story. I would without doubt recommend the creator's previous and future works, as they would be undoubtedly just as or even better than this short game! Will there ever be a Windows release? I've updated the page. The windows version should be easier to find. The mac port is newer. There's a certain file that can't be executed, but I don't know what to do with it! When attempting to run the game, it opens a warning saying it can't execute open of the files. I believe it's the .py file, what should I do? I really want to play the game! You're running DateaMink.exe, not DateaMink.py, right? Are you getting any error messages you could send? Also, make sure you've extracted the .zip file. You can't run the game from inside the .zip. Try to move your game to C:\Games\ and try from there. You could also try running the game through the itch.io app. Also, make sure that the game is not being blocked by your antivirus. Let me know if you get things fixed. I'll help any way I can. Thank you so much, Furr! It worked perfectly! I do wonder why it had to be that specific, but oh well! Thank you for your hard work!! But honestly this was a fun little game. I liked it.